Here we go! Text Interview No. 7! 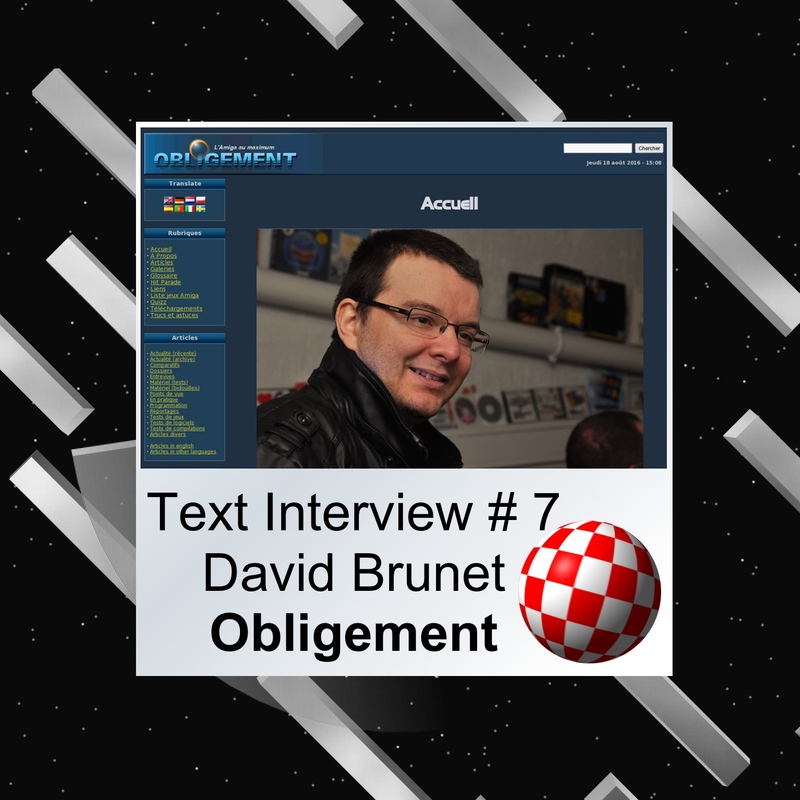 Today's guest is the guy behind Obligement portal - David Brunet. Obligement is one of the most popular places in Amiga world. And it doesn't matter that all is in French. ;) Translation tool is very good integrated. Let's talk. 1. Your first contact with computers. And was it Amiga or something else? My first contact with computers was at school, when I was 8 or 9 years old. The French government had launched its plan to introduce computers to kids and schools. This plan was called "Informatique Pour Tous" (Computers For All). We played with 8bit computers and the famous LOGO programming language. You can read on interview with Jean-Pierre Chevènement (French Minister of Education in 1985) about this plan on http://obligement.free.fr/articles/itwchevenement.php. Later, at home, my first computer was a Commodore 128D. It was a loan from a new neighbour Daniel which was fan of computers. He had several machines including an... Amiga 500! With friends, we annoyed him to play Amiga games at his home. 2. Your first Amiga. Type and configuration? There were some other models too? Which Amiga are you using now? Do you use some Amiga NG? If yes, which? This Amiga 1200 was then extended with several accelerators (Blizzard 1230, Blizzard 1260, BlizzardPPC), memory and peripherals. It was also towerised but the whole machine, with all its patches, was not very stable. I used it until 2003 and get on the wagon of MorphOS with the purchase of a Pegasos G3. Now, in term of "real Amiga", I only and rarely use an A1200 with Blizzard 1230, and just for games. My main machine is a Power Mac G5 under MorphOS. It's the natural path for me after using PowerPC Amiga. It's powerful, cheap and compatible with Amiga software (thanks to MorphOS!). 3. Your inspirations? You have created one of the most famous amiga web page - Obligement. Page event is not at English! My inspiration come from my passion for the Amiga. The Amiga is a complex machine with a complex history and a complex community. 4. Tell us something about your work? How did you start it? And why? You can read a the detailled history of Obligement on this page: http://obligement.free.fr/articles/obligement_histoire.php. I work on Obligement almost daily. It's not really a work, it's more a passion or a hobby. I don't earn money (it's quite the contrary :-)). There is no real "Obligement team" since I work alone but with the help of some proofreaders (thanks to Marc, Mickaël and Serge!) and translators (thanks to Yann-Gaël!). Finding redactors or new articles is always a difficulty and finding regular redactors is almost impossible nowdays. 5. Few months ago source code of AmigaOS 3.1 leaked. Do you think it is right time to make classic AmigaOS free or even better open source? The AmigaOS leak has revived the problem. It's right, Classic AmigaOS must be free and available legally for all. Open Source? No, I think it can generate a mess with plenty of different versions more or less compatible. 6. Vampire and FPGA technology is big success. Do you think it could be a future for us? Can it reunite community? The FPGA technology is now fully adapted for a thing like the Amiga. It's powerful enough to "emulate" the machine and surpass it. But remember it can only run the software library of the 68k AmigaOS, so with a little FPGA or a superfast FPGA, the problem is the same: what can I do with this FPGA Amigas? Currently, users of FPGA Amigas play games and that's all. Serious activities seems almost impossible since we lack of modern applications on 68k AmigaOS. Can it reunite the community? Unfortunatly not. For MorphOS or AmigaOS 4 users, the FPGA is still a step back. They can already use Classic Amiga software on theirs machines. However, I think FPGA could attract new former Amiga users which want to play Amiga games. 7. What do you think about PowerPC in Classic Amiga. And about Sonnet PowerPC? PowerPC card for Amiga was a nice idea... in 1996. PowerPC for Classic Amiga was a feat/prowess done by Phase 5 (no one in the Amiga world have reedited it). Now we have plenty of PowerPC NG machines running various flavors of our beloved operating system, so the interest is low. Besides that, we only can use PowerUP or WarpUP libraries on those PowerPC card, nothing interesting nowdays. Sonnet card on Amiga are, anyway, a good challenge for some hackers, and perfectly in line with the spirit of the Amiga. 8. What do you think about Amiga NG (AmigaOS 4.1, MorphOS and AROS)? Without Amiga NG, we still be using underpowered machines with a feature limited OS. Modern applications like playing HD videos and browsing the Web would be nearly impossible. Thanks to the three variants of Amiga NG: we can still use an "Amiga" for some modern applications and some people use them daily as theirs main machines. 9. What do you think about AROS Vision (68k)? It can bring for classic hardware modern OS. I never tried AROS Vision. But the idea is good. It's a nice way to enhance the system, run legacy software and new software. Thanks to Olaf Schönweiß for that! 10. Should our developers try to sell (for small money) apps/games to get some cash for hobby? In my opinion yes. What do you think about this? Shareware have always existed. So if developers want to sell theirs applications, they are free to do that. Paying software could encourage developers but the Amiga market is divided and so tiny that the amount of money can be ridiculous compared to the amount of work needed to created an application. In this case, developers can be feel useless and demotivated. for your own use/joy, enhance it like you want and finally raise a bounty. Everybody is happy: the developer, users who want to contribute at the bounty and users who can't give money. 11. Your biggest successes connected with Amiga, your projects or Obligement? My main success is the whole Obligement project. Magazines which lasts 20 years are scarce, espacially in IT domain. Furthermore, with more than 5100 articles, Obligement has become a real base of knowledge for the Amiga. And it's free! 12. French is not so popular language. Are you happy with Google Translator? Is it good enough to make international technical pages? In the beginning, Obligement was only in french and focused on the french users. Language was not a big problem. But with the Web site version, an english translation has become more important. So there was two solutions: write articles in english and translate older articles in english (it's too tedious for me) or find a engine for automatic translations. The first version of Google Translator was awful with some funny translations (*). But this engine is enhanced little by little. It's not grammatically correct but I think (I hope :-)) users can understand most of the texts on Obligement. 13. Our community is divided: AOS4, MOS, AROS and classic Amiga? This is not so good for Amiga future, can be something done? Can we reunite again? Some years ago, I agreed with you. But now I think that several flavors of Amiga means more choices for the users. And this situation allows the Amiga to never really die. For example, if the AmigaOS 4 fails, we can count on the three others. Unfortunatly, the community can't be reunite again. All the actual projects are too differents and have their own path. We can perhaps collaborate on some software (Odyssey, MUI, Hollywood applications...) or hardware projects (AmigaOne X5000) but that's all in my opinion. 14. In this divided situation how we should develop software? For example MUI is different for AmigaOS and MorphOS, AROS has Zune. Maybe we should have one core team for MUI/Odyssey etc., and then port software for three main systems? The actual situation of MUI is quite a problem. And it seems its development will continue to be dissociate between several groups of developers. The best version of MUI is the MorphOS one. The ideal would make this version of MUI Open Source, so others systems could have it. But since MUI is a core element of MorphOS, this will probably not happen. And in general for the Amiga developments, the best would be to release software for all flavors or with its source code. It's already the case for some, but it's not the standard. I'm sure MorphOS users will be happy to see some AmigaOS 4 applications ported to their system, and vice versa. 15. AmigaOne X5000 is delayed. What do you think about this? And what do you think about A1222 Tabor? Or maybe only Amiga 68k is the best choice? For sure you heard about Amiga Reloaded. Is it good approach or we can have something better? The hardware projects of A-Eon Technology are crazy (in the positive sense). Trevor Dickinson have a passion, the money and the ambition and he makes it a reality. He tries to keep the dream alive, it's fantastic! will not be really usefull here (except perhaps for modern graphics cards). The A1222 is a project for intermediate users. For a PowerPC machine, it's midrange or entry level. I simply fear for it's price. AROS and MorphOS users can bought cheap and powerful computers for their systems, while AmigaOS 4 users have only expensive (but new) computers. In a world of cheap computer products, where is the place for this kind of machines? The Amiga Reloaded project could be a nice idea only if it add lots of good features for the Amiga Classic. Lots of Amiga users already own an A1200 or A600 with an accelerator and various peripherals. And we have already several hardware or projects for Amiga Classic (Mimimig 1 & 2, MIST, Vampire...). The Amiga Reloaded is only an AGA machine with CF-card slots and an expansion port for a networking card. It's too little in my point of view. 16. AmigaOS 4 under WinUAE is a great success. Instead of PPC hardware maybe better solution is powerful Intel with emulation? I rather see the WinUAE/AmigaOS 4 combo like a solution for people outside of the Amiga scene to test the last version of AmigaOS. The ISO of AmigaOS 4.1 Final Edition is quite cheap and available to purchase on the Amiga Forever website, so it's ideally suited for this kind of users. In the long term, if the emulation is faster and supports also MorphOS, it can be a viable solution for a daily use (at least for me). 17. Maybe better solution is option to change architecture? Intel or ARM? Or maybe even new NG OS based on the linux core with typical Amiga GUI and look & feel? The change of architecture seems to be inevitable. But remember that lots of Amiga users are still using 68k Amigas. So even after a change of architecture, PowerPC Amigas will also continue to be used. In this case, the already divided community will be even more divided! For MorphOS, I hope the change of architecture will really arrive. For example, the limit of the memory (1.5GB, and 1.7GB in the next release) is a bigger and bigger obstacle. A new MorphOS with large memory limits will be very useful. I don't see myself in five years with a machine with only 1.7GB. Mark Olsen works on this MorphOS NG for some times. He's a very talented programmer and a lot of Morphosians count on him (Go go Bigfoot!). Intel or ARM processors is not a problem, we only need a very portable system. 18. For newcomers. What Amiga can you advise? Classic or maybe NG? Or emulator? For newcomers, I advise emulation. It's almost free and can launch thousands of software, and some of them are unique on Amiga. I also would like to advise the Amiga NG but after showing them to some friends, they all say "but, I can already do that on my Linux box!". It's sad to say that but Linux or Windows users will almost find nothing interesting in our systems. So, I think the Amiga NG systems are probably well suited only for current users. 19. Future plans for Obligement? Continue to write the Amiga history. Write news rubrics for the early days of the Amiga (currently Obligement have Amiga news rubrics from 1988 to nowdays, but not the early days). Make more interviews with former Amiga personalities. OCR of several french Amiga magazines. Redo the gallery section with more images and a new menu. 20. Our future? Community and future of Amiga? We are getting older, is there any chance to put Amiga in more usable form? For Classic Amiga, emulation can be the solution and WinUAE are already good for that. For the Amiga NG, they are in survival mode since a long time and they attract only very few new users. Perhaps a change of architecture (we need to break current limits) and a change in the licence (make them free!) could perpetuate those systems. But until then, we must enjoy our Amiga regardless of the flavor. Thank you Krzysztof for the interview. I'd like to say a last word for the Amiga community: do something with/for your Amiga! Programming, making music or graphics, writing an article, doing a translation, organizing a meeting... if everybody did a "little something" (instead of chatting on forums :-)) the situation of the Amiga would be a little better.